Did you know September is Library Card Sign-Up Month? Yep, it sure is. Do you have your library card? If not, this month is a terrific month to get one. Everyone’s favorite doghouse-flying beagle, Snoopy, is this year’s Honorary Chair for Library Card Sign-up Month. Special Peanuts library cards that will be available soon and there are lots of Peanuts™ goodies available, too. Check it out HERE (but come right back for a Skulls, a fascinating nonfiction book!) Who out there has their very own library card? Skulls is truly a fascinating look at the craniums of popular animals and some not-so-common animals. From the elephant and his surprisingly odd-shaped brain to the ferocious skull of a piranha, Skulls will have you mesmerized. 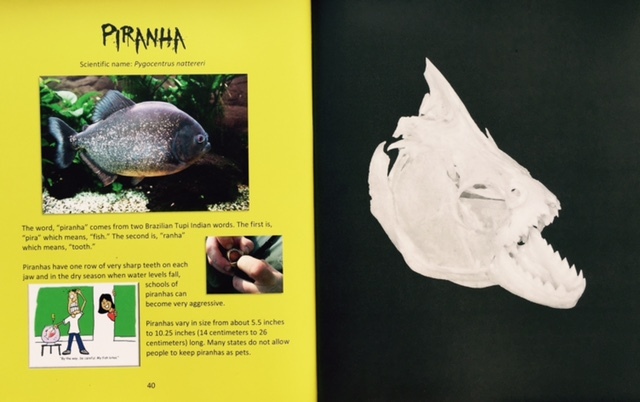 Included with each animal’s skull is the scientific name, a short introduction to the animal, and then an unusual or fun fact. Every detail has been fact-checked by a teacher with a Master’s Degree in Science Education. What kind of things can you learn by reading Skulls? Did you know the American armadillo—Nine-Banded Armadillo—can jump up to four feet straight into the air? Or that a tiger is actually not a very good hunter, only catching his prey, on average, once per ten tries? Hippos, whose skulls, I think, resembles pre-historic tigers, are related to whales and porpoises. I had no idea. Unfortunately, neither a whale nor a porpoise skull is included to compare with the very dangerous hippopotamus. One last tidbit: If you do not like making your bed each morning, consider the gorilla. Gorillas build a new nest every single day! The one fault I find with Skulls, and this is more a preference than a fault, is the multi-colored pages. Some of them, especially a few of the darker shades, were harder to read. I would have preferred a clean white background. Oddly, after page 48, the page numbers disappear until page 56. 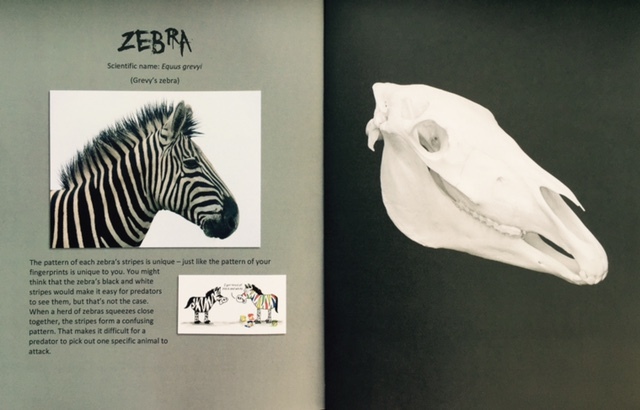 On the right side (uh, Yeah, pun intended), of each spread shows the highlighted animal’s skull (always a shade of white) against a black background. This high contrast effect makes the skull pop out, showing even the smallest details clearly. Very nice. Skulls held me from page one to the back cover. 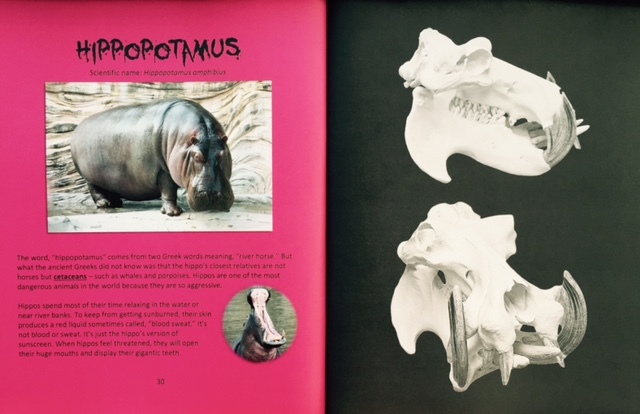 Kids interested in animals and what makes them tick will enjoy Skulls, as will teachers looking for a fun adjunct text for their anatomy, biology, or other related science lesson. The author included a fun introduction (with a written tome about human skulls, but no picture), an index, a short whose-skull-is-it quiz, and a glossary of unfamiliar terms. 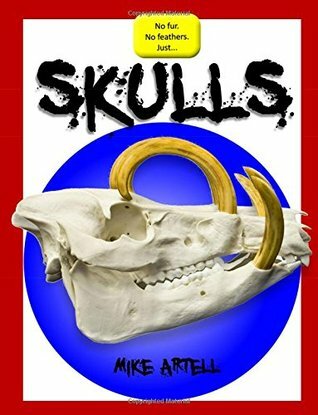 The well written and researched Skulls is kid-friendly and inexpensive, making it accessible to most anyone interested in the uniquely interesting skulls of animals. Will there be a Skulls 2? I hope so. There are many interesting animals waiting to show us their naked being. SKULLS. Text copyright © 2015 by Mike Artell. Skulls images copyright © 2015 by Skulls Unlimited. Reproduced by permission of the publisher, MJA Creative, LLC, Covington, LA. Purchase Skulls at Amazon —Book Depository—IndieBound Books—MJA Creative. Learn more about Skulls HERE. That will be a popular book! Skulls and all types of bones are fascinating for kids. And some grown-ups! I wasn’t sure. Thanks for verifying this. I hope he follows up with a second book and includes the human brain—a child’s—so kids can compare theirs to the featured animals.